ENSENADA, Mexico— With pre-running on the rugged race route to open Saturday, Oct. 22, official entries from 27 U.S. States and 11 countries were included in Thursday’s drawing for start positions in various classes for next month’s 49th anniversary of the iconic SCORE Baja 1000 desert race, the season finale of the four-race 2016 SCORE World Desert Championship. Nearly 250 cars, trucks, UTVs, motorcycles and quads from 35 U.S. States and 15 countries are expected to take the green flag on Friday, Nov. 18 for this year’s 49th SCORE Baja 1000. The granddaddy of all desert races will be held Nov. 15-20 in Baja California Norte on Mexico’s majestic Baja California peninsula, starting and finishing in the seaside port of Ensenada, 65 miles south of the U.S. Border at San Diego. The drawing for starting positions, by class, for all classes except SCORE Trophy Truck and Trophy Truck Spec, was held Thursday. A solid total of 183 vehicles are officially entered as of today and nearly 75 additional entries are expected to enter in the five weeks before race day in Ensenada for the legendary race. So far among the car, truck and UTV classes, SCORE Trophy Truck has the most entries with 28, followed by Trophy Truck Spec with 20, Pro UTV FI with 19, Class 10 with 18, the unlimited Class 1 with 15 and Pro UTV with 12 officially entered to date. Among the motorcycle classes, the Pro Moto Ironman (solo) rider has the most entries with six today followed by the Pro Moto Unlimited and Pro Moto 40 (m/c riders over 40 years old) classes with five entries each so far. In the Sportsman classes, leading the way is Sportsman Motorcycle with 11 entries to date. Online entry registration for the race continues at Register Here for Race. Late entries received after the drawing will be placed by class in the next available starting position following those that entered in time for the random draw. This year’s SCORE Baja 1000 will be a loop race and pre-running on the approximately 830-mile course will open on Saturday, Oct. 22 with the start to Ojos Negros only allowed on Wednesday and Thursday of race week (and only in the outbound direction). The start line and finish line will once again be adjacent to the iconic Riviera del Pacifico Cultural Center in the heart of Ensenada and the first and last several spectator-friendly miles running up and back down the Ensenada Arroyo. In addition to the 27 States represented on the entry list to date, racers have officially entered from 10 countries. In addition to the United States, entries so far have come from Australia, Austria, Belgium, Canada, Germany, Guatemala, Japan, Lithuania, Mexico, New Zealand and the US Territory of Guam. The SCORE Baja 1000 the oldest continuously-held desert race, the most prestigious, the most well known and has the most rugged race courses in all of desert racing. This year’s race will start for the 42nd time and finish for the 24th time in Ensenada and remains one of the single most appealing accomplishment to a racer. Since 1967, the race has been run over the mysterious Baja California peninsula every year except 1974 when the international fuel crisis forced a cancellation. The race week festivities will cover Nov. 15-20, with the race and all side events starting and finishing in Ensenada. Pre-race festivities on Thursday (Nov. 17), for the SCORE Baja 1000, including the vastly popular tech and contingency of all vehicles and the SCORE Manufacturer’s Midway will be held from 9 a.m. to 6 p.m. PT on Boulevard Costero in front of the Riviera del Pacifico Cultural Center. The pre-race mandatory driver/rider briefing will also be held on Thursday (Nov. 17) at 7 p.m. PT in the Cathedral Room at the Riviera del Pacifico Cultural Center. Racer registration will be held in the Red Room at the Riviera del Pacifico Cultural Center in Ensenada. Racer registration will be held from 5 p.m. to 8 p.m. PT on Tuesday (Nov. 15), from 10 a.m. to 7 p.m. PT on Wednesday (Nov. 16) and 9 a.m. to 5 p.m. PT on Thursday (Nov. 17). Media registration will be held as well in the Red Room at the Riviera from 1 p.m. until 6 p.m. PT on Wednesday (Nov. 16), 9 a.m. to 5 p.m. PT on Thursday (Nov. 17) and the BFGoodrich Tires/Baja California Secretary of Tourism SCORE Media Center will be open on Friday (Nov. 18) at 5:30 a.m. PT until the course closes at approximately 11 p.m. PT (Nov. 19) on Saturday and will re-open on Sunday from 8 a.m. until Noon PT. Two special Monster Energy parties, open to the public will be held before the race starts. On Wednesday (Nov. 16) starting at 7 p.m. PT at the start/finish line area will be the SCORE Baja 1000 Goes Green Monster Energy Party. On Thursday (Nov. 17), the night before the start of the race, the Monster Energy SCORE Papas & Beer Street Party on Avenida Ruiz in front of Papas & Beer will start at 7 p.m. PT. As the celebration continues all-night on Friday, all day and evening on Saturday while official finishers cross the line and tales are added to the legacy of the event, the post-race awards fiesta will be held in the Cathedral Room at the Riviera starting at 10 a.m. PT on Sunday (Nov. 20). Jumpstarting the festivities for the SCORE Baja 1000 for the third straight year will be the massive SEMA SCORE Baja 1000 Experience at the Las Vegas Convention Center (Oct. 31-Nov. 4) and the special SCORE Baja 1000 qualifying for SCORE Trophy Trucks and the Trophy Truck Spec class. With both events presented by BFGoodrich Tires, qualifying will be held at the Off-Road Track at Las Vegas Motor Speedway (7 p.m. PT, Tuesday, Nov. 1). As it has for over four decades, SCORE has put together another agonizingly memorable race course, this one for a loop race, with all of the foreboding, unforgiving terrain that the northern state of the majestic Baja California peninsula has to offer. 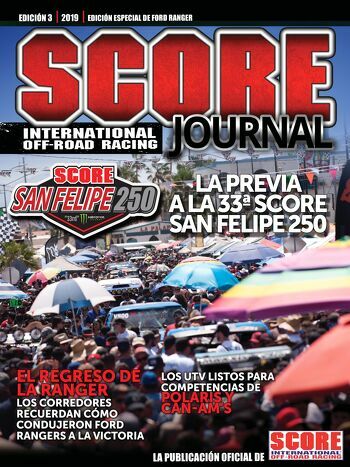 SCORE CEO/President Roger Norman and SCORE Race Director Jose A. Grijalva have designed and finalized this year’s SCORE Baja 1000 race course. Starting and finishing in the heart of Ensenada in front of the historic Riviera del Pacifico Cultural Center, the course travels in a counter-clockwise direction. It includes the approximate 20 mile stretch to Ojos Negros which is used in both directions. Outgoing, the course heads south from Ojos Negros through Santo Tomas and then runs along the picturesque Pacific Ocean for over 100 miles and then back across to the center of Baja California Norte. The approximately 830-mile course covers both sides of the peninsula and includes four checkpoints. The race will have its normal start from Ensenada to Piedras Gordas, then out to highway 3 around Rm 20.7 and will go to Km33 and get back on the dirt. The course will go past Rancho Grijalva to El Mezcal and head to Uruapan using La Lagrima Rd, a different road than in past years. From Santo Tomas, the course heads to the coast of the Pacific Ocean and runs down to San Quintin, Nuevo Odisea and then to El Rosario. The course will travel up the well known hill La Vivora, el Arenoso, and will loop around from San Juan de Dios at approximate Rm305 to El Metate Rm 340, Los Martires Rm 363 and go back to San Quintin on the east side of the highway and run north to Col. Vicente Guerrero, Jaramillo and Colonet. The course will travel a new route from Colonet to Llano Colorado and across to Valley de Trinidad. The race course goes along the highway from San Matias to Villa del Sol then crossing the highway at El Chinero, north to Coabuso Junction and then climb up the summit in the opposite direction as previous races from the desert to Nuevo Junction and on to Catarina. From Catarina, it will be back to Ojos Negros and from Ojos Negros back to the finish line. The four checkpoints will be located at Santo Tomas (CP 1–race-mile 87), El Rosario (CP 2–rm249), Vicente Guerrero (CP 3–rm457) and Nuevo Junction (CP 4–rm730). Pre-running will open on Saturday, October 22, allowing competitors nearly three weeks of practice time on the official race course.